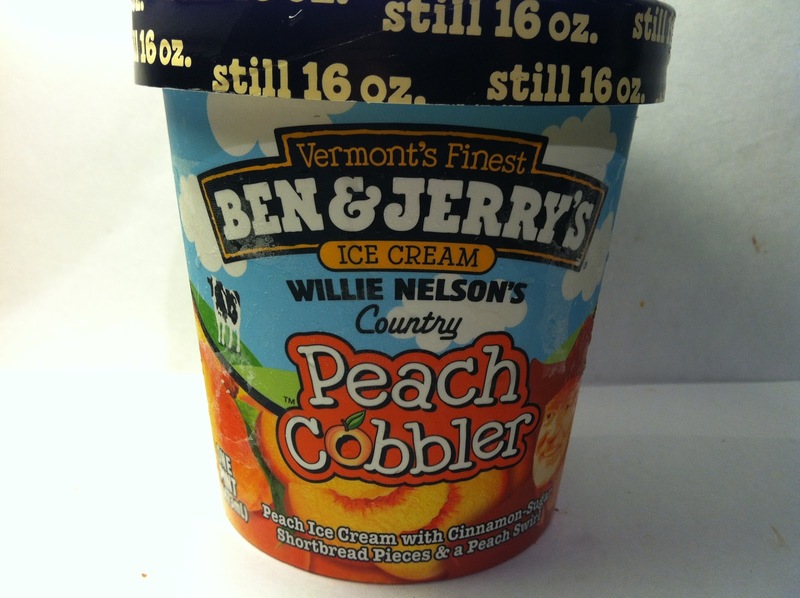 I mentioned in a previous review of Ben & Jerry's Phish Food flavor that I was feeling particularly psychedelic on a trip to Meijer and picked up that flavor along with this Willie Nelson's Country Peach Cobbler flavor on sale for $3.00. Willie, as you may or may not know, likes to smoke the herb, so these two fit together nicely in a almost drug induced shopping binge. Like the Phish Food pint, this one contains 220 calories per serving in the four serving pint, so it's on the very low scale in terms of calories in the Ben & Jerry's ice cream spectrum. Being that I usually buy the calorie dense Ben & Jerry's ice creams, this purchase was a bit of a departure for me. The pint describes this as "Peach Ice Cream with Cinnamon-Sugar Shortbread Pieces & a Peach Swirl" and I can confirm that I was at least visually able to see all those components. 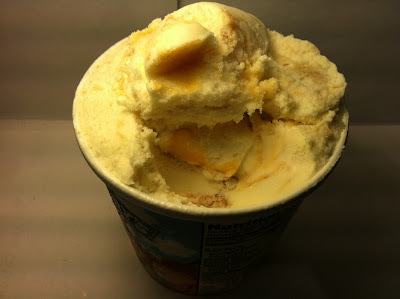 The peach ice cream added a slight orange-ish hue to the ice cream and there were also small peach chunks spread throughout the pint in addition to a very thin and not plentiful peach swirl. The cinnamon-sugar shortbread pieces were also spread evenly throughout the pint and maintained a soft texture, but they were not very large nor very plentiful. Basically, if you are the type of person that likes a lot of mix-ins in your ice creams, then this one is going to put you up a creek that shall remain nameless without a paddle. The lack of mix-ins really affect the taste on this one as this is one of the more milder tasting Ben & Jerry's pints that I've ever sampled. The peach ice cream, while there, is extremely faint in its taste. This faint taste also applies to the peach chunks that were found intermittently throughout the pint as well. They were soft and sweet, but really lacked any sort of punch (not that a typical peach has a strong flavor, but this was weaker). The potential saving grace to the peach flavor in this one was the peach swirl as it had a stronger sweet taste, but it was so thin and sporadically spread throughout the pint, that it really did not have a great chance to save this one. As for the last component, the shortbread pieces, their texture alternated on a piece-by-piece basis of being cake-y and soft or crunchy. The soft piece were nice to come across, and had a nice semi-sweet cinnamon flavor, but the crunchy pieces lacked any flavor at all. I guess you could say that the crunchy pieces were the "crust" of the cobbler, but all they really did was add more flavor problems to a pint that really needed help. Buy It or Fly By It? Since the recurring theme of this review is that this one needed help in the flavor department because it was so weak, this one gets a pretty obvious FLY BY IT rating. Curiosity is the only thing that would get a person to buy this one (it got me), because the flavor of this one is just not there. It's definitely not one that would ever cross my mind to purchase ever again.